Based on images and topographic data, new research shows that the Eden Patera basin on Mars is a volcanic caldera, not an impact crater. Tucson, Arizona — A research project led by Joseph R. Michalski, Senior Scientist at the Planetary Science Institute, has identified what could be a supervolcano on Mars – the first discovery of its kind. In a paper published October 3 in the journal Nature, Michalski and co-author Jacob E. Bleacher of NASA Goddard Space Flight Center describe a new type of volcanic construction on Mars that until now has gone unrecognized. The volcano in question, a vast circular basin on the face of the Red Planet, previously had been classified as an impact crater. Researchers now suggest the basin is actually the remains of an ancient supervolcano eruption. Their assessment is based on images and topographic data from NASA’s Mars Odyssey, Mars Global Surveyor and Mars Reconnaissance Orbiter spacecraft, as well as the European Space Agency’s Mars Express orbiter. In the Nature paper Michalski and Bleacher lay out their case that the basin, recently named Eden Patera, is a volcanic caldera. Because a caldera is a depression, it can look like a crater formed by an impact, rather than a volcano. The researchers also suggest a large body of magma loaded with dissolved gas (similar to the carbonation in soda) rose through thin crust to the surface quickly. Like a bottle of soda that has been shaken, this supervolcano would have blown its contents far and wide if the top came off suddenly. After the material is expelled from the eruption, the depression that is left can collapse even further, causing the ground around it to sink. Eruptions like these happened in ages past at what is now Yellowstone National Park in the western United States, Lake Toba in Indonesia and Lake Taupo in New Zealand. 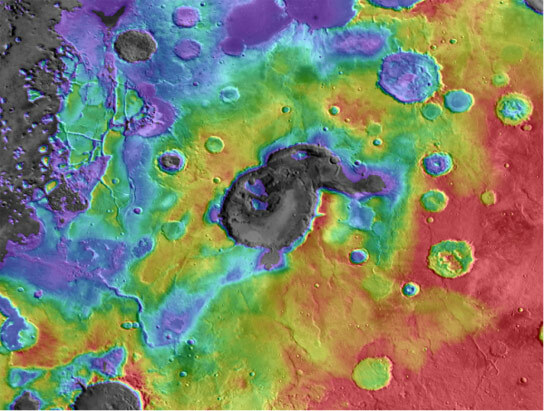 Volcanoes previously had not been identified in the Arabia Terra region of Mars, where Eden Patera is located. The battered, heavily eroded terrain is known for its impact craters. But as Michalski examined this particular basin more closely, he noticed it lacked the typical raised rim of an impact crater. He also could not find a nearby blanket of ejecta, the melted rock that splashes outside the crater when an object hits. The absence of such key features caused Michalski to suspect volcanic activity. He contacted Bleacher, a volcano specialist, who identified features at Eden Patera that usually indicate volcanism, such as a series of rock ledges that looked like the “bathtub rings” left after a lava lake slowly drains. In addition, the outside of the basin is ringed by the kinds of faults and valleys that occur when the ground collapses because of activity below the surface. The existence of these and other volcanic features in one place convinced the scientists Eden Patera should be reclassified. The team found a few more basins that are candidate volcanoes nearby, suggesting conditions in Arabia Terra might have been favorable for supervolcanoes. It is also possible massive eruptions here could have been responsible for volcanic deposits elsewhere on Mars that have never been linked to a known volcano. “If just a handful of volcanoes like these were once active, they could have had a major impact on the evolution of Mars,” Bleacher said. Project funding was provided by the NASA Mars Data Analysis program. 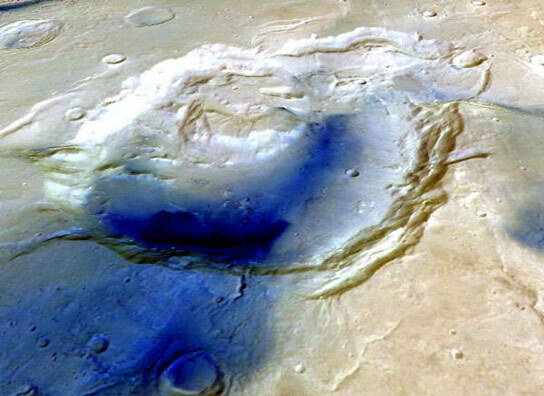 Be the first to comment on "Scientists Believe Mars Crater is the Remains of an Ancient Supervolcano"